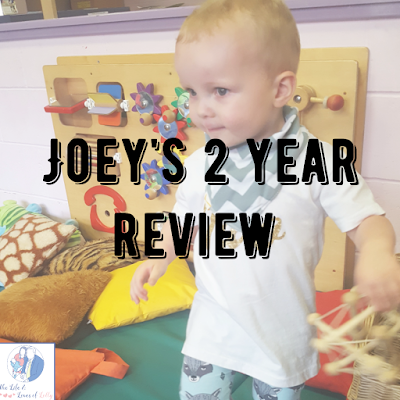 Yesterday we had Joey's 2 year review at our local children's centre. Usually this review would take place between 24 and 27 months old, Joey is 25 months and we asked for his appointment to be brought forward because of a few concerns we have regarding his development. Here is a short video explaining the process and the outcome of his review. I wanted to do a video as I thought it would be easier to explain everthing rather than in a blog post. So we are now starting the process of referring ourselves to speech therapy. The health visitor who conducted his review had initially told us about a drop in group that helps with speech, but then after explaining his fussiness with certain types of food she thought proper speech therapy would be best. She also questioned whether we thought Joey had problems with his hearing and could be why he gets frustrated so much and because of his lack of communication. We've never thought he's had an issue with his hearing, he always turns and looks at us when you call his name. Hopefully, we'll be able to get referred soon to speech therapy. And I'm hoping that we'll start to see some improvement. As always I will try and keep you all updated. All kids are different though so I know not to worry too much about the journey ahead.